Like many people. They know Winnie the Pooh he is an iconic character. When I was growing up. He wasn't everywhere you looked in the 0-3 year old market. He was someone you could relate to, just a hardworking bear trying to make his little community all get along. Even if the neighbourhood was angry, Pooh's positive vibes would make people think twice about how they are looking at things. It was a musty book, well worn and enjoyed long before I was even born. That makes it pretty awesome to me. 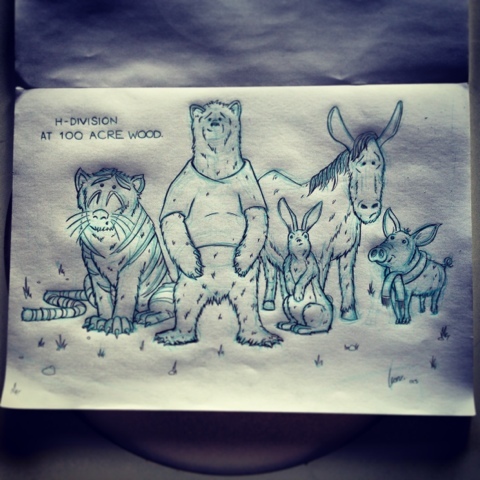 Here is my take on Winnie the Pooh. H(oney) - Division . 100 acre wood. This is just a quick photo and a WIP. I will scan and update in the coming weeks.